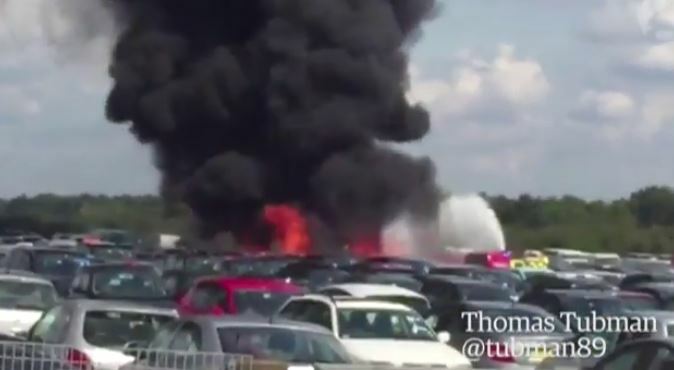 The sister and stepmother of notorious al-Qaida leader Osama bin Laden were reportedly among the dead after a business jet crashed at a private airport in Hampshire and ploughed into a car auction centre. Without confirming the identities of the victims, the Saudi ambassador to Britain, Prince Mohammed bin Nawaf Al Saud, offered condolences on the embassy’s official Twitter account to the Bin Laden family, a prominent Saudi Arabia clan with vast business interests. “His royal highness Prince Mohammed bin Nawaf bin Abdul Aziz, the ambassador of the Custodian of the Two Holy Mosques to the United Kingdom, offered his condolences to the sons of the late Mohammed bin Laden and their relations for the grave incident of the crash of the plane carrying members of the family at Balckbushe airport,” he said in the tweet. The Saudi embassy said it was working with British authorities to investigate the incident and to ensure the speedy handover of the bodies for funerals and burials in the kingdom. The Saudi-owned al-Hayat newspaper, citing a statement by the Saudi general authority of civil aviation , said on its website that the Embraer Phenom 300 with three passengers and the pilot crashed during takeoff from Blackbushe airport. The statement did not identify the victims, but some Saudi media suggested on social media or on their websites that they were relatives of Osama bin Laden, who was shot dead by US forces in Pakistan in 2011. It was not immediately possible to confirm the reports but it emerged that the aircraft was registered to a firm owned by the Bin Laden family. Police would neither confirm nor deny on Friday night whether they were investigating reports that any members of the family were on board. The light aircraft, which had with space for up to nine passengers and was thought to be worth £6m, crashed as it attempted to land at Blackbushe airport, seven miles north-west of Farnborough, a spokesman for the airport said. The website Flight Radar, which tracks air traffic, shows a flight matching that description circling the airport, before appearing to come in to land. The flight took off from Milan–Malpensa airport. Acting chief inspector Olga Venner, of Hampshire police, speaking from the scene, said: “We can confirm that there were four people on board, including the pilot. Venner said police have launched a joint investigation with the Air Accidents Investigation Branch (AAIB). The airport’s spokesman said: “A Phenom 300 jet with four persons on board crashed near the end of the runway around 3.09pm while attempting to make a landing,” he said. Hampshire fire brigade sent four pumps and a Land Rover to the scene, while South East Coast ambulance service confirmed a “multi-vehicle” response. A spokeswoman for the ambulance service said it had received reports that the aircraft missed the runway and crashed into the British Car Auctions site at the airport. Other reports suggested the plane had crashed on or just after takeoff. Andrew Thomas, who was paying for a car at the time of impact, said the plane exploded. Joe Ramos told local station Eagle Radio that the aircraft had clipped the fence of the auction centre. Daphne Knowles, 70, who lives nearby, told the GetSurrey news site: “I was in a field with the cattle and I heard an aircraft coming very, very fast from behind me. The engines were screaming far too much and the aircraft was trying to land – I’m a glider pilot and I thought it’s far too low to the ground. A group of people, believed to be the family of the victims, were escorted to the site by police officers. Blackbushe airport provides facilities for private jets and hosts a flying school. It was a originally an RAF base and was once a busy passenger airport before the growth of Gatwick and Heathrow eclipsed it.